A yachtsman has become the first quadriplegic sailor to complete a solo voyage across the Atlantic. Geoff Holt, 42, from Southampton, began the 2,700-mile (4,345km) journey from Lanzarote to Tortola in the British Virgin Islands, on 10 December. His voyage was hampered by the lack of wind and mechanical problems on his boat, Impossible Dream. His wife Elaine and son Timothy sailed out to greet Mr Holt off the coast of Cane Garden Bay. Mr Holt suffered a diving accident 25 years ago in the bay that left him paralysed. During the voyage, he has been aided by a carer and filmed by a cameraman, but did all his own sailing in the 60ft (18m) purpose-built catamaran. He told BBC News: "It's fantastic, it's absolutely wonderful to be back after 25 years to sail across the Atlantic Ocean, it is quite emotional. "This has been years in the planning. It has been my dream to sail back across the Atlantic and I have only gone and done it." This is the fourth time Mr Holt has sailed the Atlantic, but the first since his life-changing accident in 1984. He broke his neck while diving into shallow water and has used a wheelchair ever since. During his record attempt, Mr Holt has had to overcome engine problems and unexpectedly light prevailing winds. He has limited use of his arms and hands and used a hydraulic push button technology to sail the vessel on the 28-day voyage. Legendary sailor Sir Robin Knox-Johnson led the tributes to Mr Holt. "What a tremendous thing to have completed," he said. "Geoff continues to raise the bar when it comes to sheer determination to allow nothing to stand in his way. "I am so proud of his achievement." 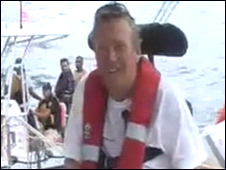 Mr Holt is already the first quadriplegic sailor to sail solo around Britain - a feat he achieved in 2007.